Revealing the Origins of Life — No one knows how life began billions of years ago. But now chemist John Sutherland has created the conditions in which the building blocks of RNA, one of the key molecules of life and the probable precursor to DNA, assemble themselves naturally. Origins of the Solar System — Combining chemical evidence from meteorites with the latest computer simulations, scientists show how, nearly five billion years ago, a supernova shock wave could have swept through a cloud of dust and gas and caused it to collapse, eventually forming the sun and planets. Lice and Human Evolution — After sucking our blood for millions of years, lice are suddenly proving their value: their DNA turns out to hold a treasure trove of clues about our evolution. Profile: André Fenton — Mr. Fenton’s work with dementia and Alzheimer’s patients may one day illuminate the biological root of memory itself. This DVD is now in our lending library. 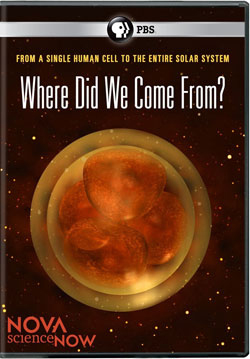 Title: Where Did We Come From? ID number 2060. To Order, visit the Video Lending Library and follow the simple instructions. This entry was posted in Teaching Tools and tagged NOVA, science, Video Lending Library. Bookmark the permalink.